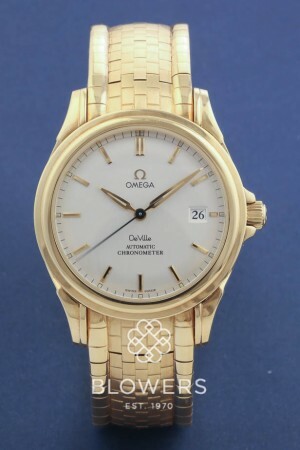 18ct Yellow Gold Omega De Ville Co-Axial Chronometer 4831.30.00. Automatic Co-Axial Omega calibre 2500 movement. Case diameter 37.5mm. Water resistant to 100 meters. Power reserve of 48 hours. Silver dial with index hour markers. Date at 3 o’clock position. Scratch-resistant sapphire crystal glass. 18ct Yellow Gold bracelet with folding clasp. Box and papers dated November 2006. Our reference S22094. SKU: 3013595. Categories: De Ville, Omega.